Key documents from a manslaughter case involving a nephew of former Mayor Richard M. Daley that vanished from the Chicago Police Department and then mysteriously reappeared weren’t lost or misplaced — they were “removed” without authorization, apparently by someone in the department. That’s according to a newly obtained report made by the police lieutenant who said he found the missing records, which included a handwritten note saying “V DAILEY SISTER SON.” That appears to have been a reference to Daley nephew Richard J. “R.J.” Vanecko, who was indicted in December on a charge of involuntary manslaughter as a result of a special prosecutor’s investigation into the 2004 death of 21-year-old David Koschman of Mount Prospect. Police Lt. Denis P. Walsh said he found the missing documents “lying on the top shelf of a filing cabinet located in the sergeants office of Area 3 Violent Crimes” at Belmont and Western, according to a police internal affairs report obtained by the Chicago Sun-Times. Walsh told internal affairs investigators he had repeatedly searched that area over a span of six months, beginning in January 2011. That was when the Sun-Times first asked for copies of all records from the case. But Walsh said the documents weren’t there until he found them on June 29, 2011. He filed a report with his boss three weeks later. “The file which was believed to have been lost was obviously not lost but had been removed and returned in violation of department rules and regulations,” Walsh wrote in the July 20, 2011, memo to Area 3 Cmdr. Gary Yamashiroya. According to the internal affairs findings, investigators don’t know when the records were removed from the case file, who took them or who returned them. These are the records that were taken from the Chicago Police Department’s file on David Koschman’s death and later returned, after the police closed the case without charges. The “investigative file inventory” ­— a one-page record that lists the documents in the file. A detective’s “general progress report” that contained a handwritten note that read: “V DAILEY SISTER SON” — an apparent reference to Koschman’s alleged assailant, Richard J. “R.J.” Vanecko, a nephew of then-Mayor Richard M. Daley. A photo of a police lineup that included Vanecko. “A photocopy of the front of the file turned over by former Det. Yawger, which is miscellaneous names and phone numbers, as well as miscellaneous information." Color photos from the Cook County morgue. The police previously released copies of the missing records, which also included a detective’s notation that Vanecko had been acting in a “very aggressive” manner before Koschman was struck during a drunken confrontation on Division Street near Dearborn early on April 25, 2004, causing him to fall and hit his head, leading to his death 11 days later from brain injuries. But the police had refused to make public the findings of the Internal Affairs Division’s investigation of Walsh’s report that someone took the files in violation of department rules. They said the IAD report wasn’t subject to the state’s public records law. The Sun-Times filed an appeal with Illinois Attorney General Lisa Madigan, who told the police last month to release the internal affairs findings. Mayor Rahm Emanuel’s Law Department released the 18-page report weeks later. Walsh, a second-generation Chicago cop, did not respond to requests for comment. According to the newly released reports, Walsh said the records reappeared at 9:39 p.m. on June 29, 2011 — four months after detectives closed the Koschman case without seeking charges, concluding that Vanecko punched Koschman but shouldn’t be charged because he acted in self-defense. The records surfaced as Joseph Ferguson, the City Hall inspector general, and his staff had begun investigating the police department’s handling of the case. Citing a “missing files syndrome” and ripping “the fiction of self-defense . 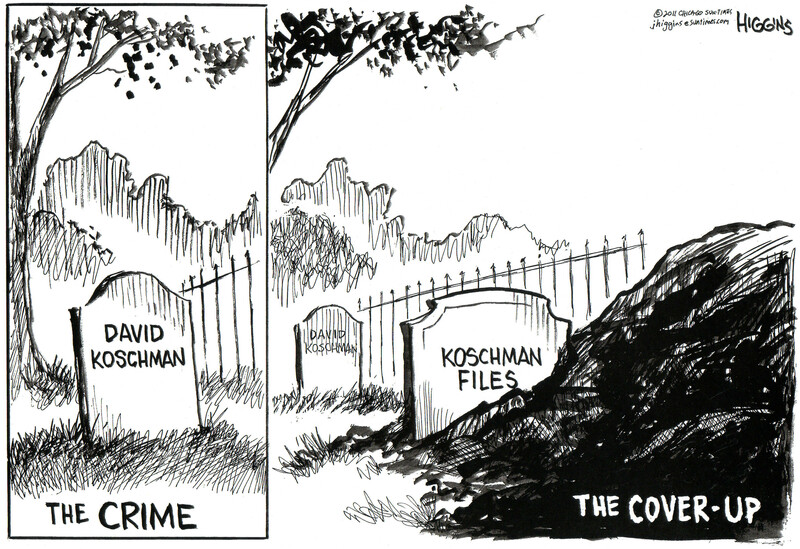 . . conjured up by police and prosecutors,” Cook County Circuit Judge Michael P. Toomin appointed former U.S. Attorney Dan K. Webb last April as a special prosecutor to re-examine the Koschman case. Webb got the manslaughter indictment against Vanecko and is continuing to investigate why police and prosecutors didn’t charge him. Neither Webb nor Ferguson, who is assisting Webb’s investigation, would comment. Police Supt. Garry McCarthy’s office had no comment other than to say the department is “cooperating fully” with Webb. The day after Walsh wrote the memo to his boss about the no-longer-missing files, Sgt. Richard Downs of the department’s Internal Affairs Division opened an investigation that ended 35 days later with Downs saying he was unable to identify who took the records or returned them. No one was disciplined. Walsh — who oversees detectives at Area 3, including Rita O’Leary, one of the original detectives on the Koschman case in 2004 — appears to be the only officer Downs interviewed. In 2004, Walsh was a field lieutenant in the department’s 18th District. Uniformed officers from that North Side district responded to the call that Koschman was lying unconscious in the street. Later that year, Walsh was arrested for attacking a female gas station attendant outside Kalamazoo, Mich. He received a 30-day suspension from the police department and was later convicted of assault and battery.